New survey data released by the Census Bureau last week provides more strong evidence that the nascent housing recovery is being built on a solid foundation. The latest Housing Vacancy Survey (HVS) (which provides quarterly updates on the number of households as well as vacancy and homeownership rates) indicates that as of the third quarter of this year U.S. households were increasing at a rate of just over 900,000 per year, giving a strong boost to overall housing demand. This represents a substantial increase from 2011 when the same survey found that the country only added about 635,000 households. 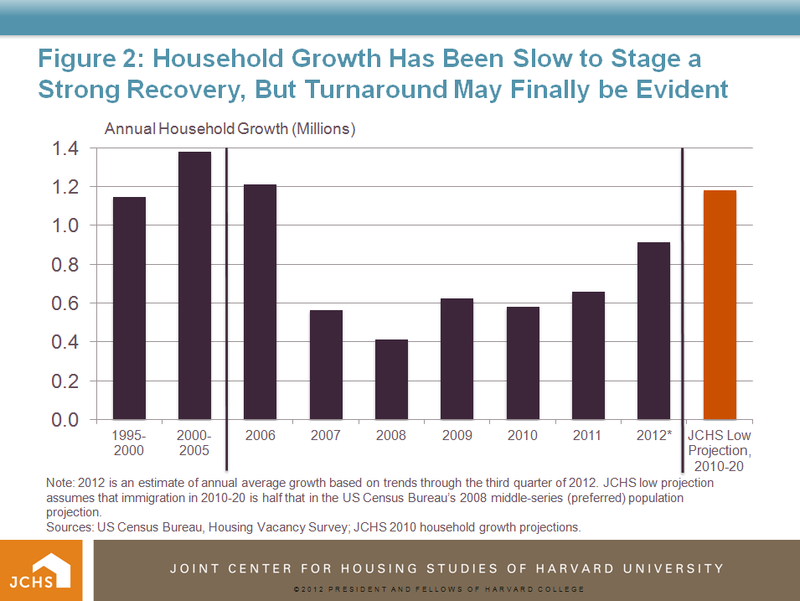 While still well below the rate of 1.18 million per year that the Joint Center estimates the U.S. is likely to average over the 2010-2020 decade, the upturn in 2012 indicates that the moderate but steady pace of economic growth is finally translating into increased demand for housing, which bodes well for a sustained recovery. Much of the attention on housing market woes has focused on the supply side. Certainly, as the housing bubble was bursting at the end of 2006 the excess supply of housing was a significant contributor. 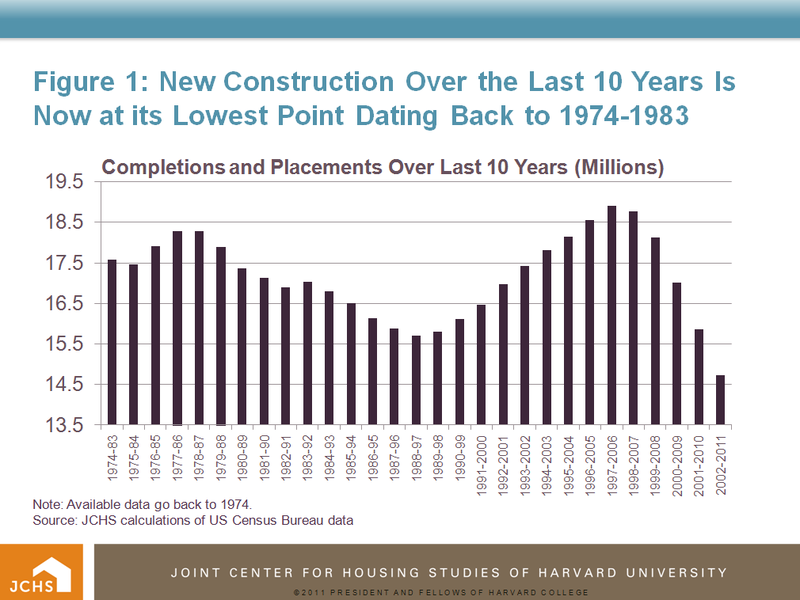 As of that time, the U.S. had added more new homes over the previous 10 year period than at any other point going back to the early 1970s when record keeping for housing completions and mobile home placements began. But after five straight years of housing starts below 1 million units a year—a level last seen in 1945 when World War II was ending—it is hard to argue that the housing market is still suffering the after effects of overbuilding. 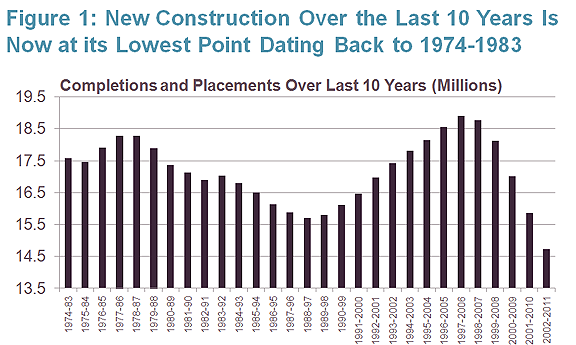 In fact, by the end of 2011 the total amount of new housing put in place over the previous 10 years was the lowest since record keeping began. Instead, the lagging recovery in the housing market has been more attributable to anemic growth in the demand for housing as indicated by weak household growth. According to the HVS, household growth fell sharply in 2007 as the housing bubble collapsed. (See Figure 2.) After averaging 1.35 million from 2000 through 2006, over the next 5 years annual household growth barely exceeded 600,000. Given the trends of the last five years, the spurt in household growth to an annual rate of 900,000 through the first three quarters of this year is notable. 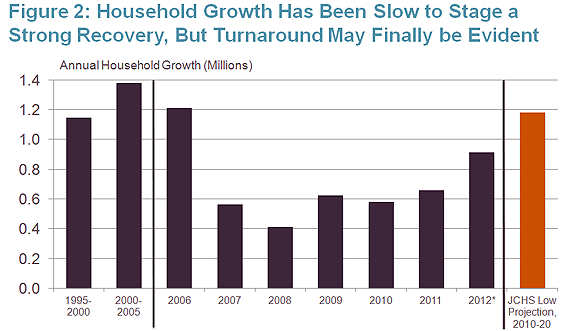 If the upward trend in household growth continues, housing should see a sustained recovery in 2013.